Children’s Liturgy of the Word (CLW) programs are a growing trend at many parishes across the country. During CLW, young children leave the sanctuary during the Liturgy of the Word to hear the scripture readings proclaimed and explained at an age-appropriate level. These sessions are not faith formation classes, arts-and-crafts activities, or babysitting during Mass. 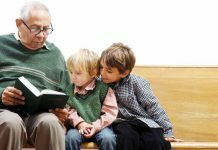 Rather, the children hear the same Mass readings as adults – but in simpler terms that are easier to grasp. One benefit of CLW is that, even when faith formation sessions end for the year, catechesis can continue during summer months. Some companies even offer educational materials specifically targeted for use in CLW programs. The children sit on the floor, and the CLW leader asks them to greet each other. Usually, they sing a gathering song (something child-friendly with hand motions). Then, the leader tells the children about the theme for the day. At that point, the children profess a child-friendly version of the Apostle’s Creed, and if time permits, everyone offers petitions for prayer. To gain feedback about their CLW program, she sent an e-mail question to parents in her parish. Kaluza loves being with children and is a teacher by career. “When I lead CLW, I am amazed at the openness, the love, and the questions that the children bring,” she noted. “I absolutely adore sharing the word of God with children, and I especially like when the children pray for their family and friends. 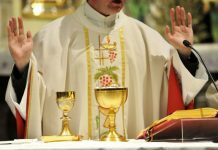 Some CLW critics, however, express concern about children being taken out of the sanctuary during Mass – suggesting that they (as well as the adults and teens who help lead the CLW program) miss a large portion of the liturgy. 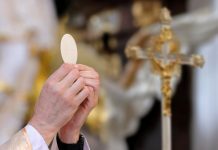 In his May 2013 article in the e-publication Catholic Stand, Jake Tawney, a father from central Ohio, raises some questions about whether this type of program should be allowed in parishes. St. Anthony Catholic Church in Dubuque, Iowa, offers an age-appropriate Children’s Liturgy of the Word for ages five through third grade during the 10:30 a.m. Mass. The children leave right before the first reading (the priest invites the leaders and children to approach the altar and process downstairs to a conference room). One child is chosen to carry a banner, and the leader follows with the children’s lectionary – holding it elevated. Music plays as they leave the sanctuary. The group then discusses that Sunday’s Gospel message, sings a modified version of the Apostle’s Creed, and ends with Prayers of the Faithful. The children also receive a bulletin that accompanies the readings. Parents who are interested in the educational materials used during CLW can also access sample lessons through the parish’s website. Lisanne Jensen serves as the coordinator of Faith Formation and Youth Ministry at The Church of St. Joseph and as the Secondary Faith Formation and Youth Ministry coordinator at St. James, both in the Diocese of Albany, New York. She resides in Columbia County, New York, with her husband and two children.